With the thinning of the ozone layer, every rider needs to be more aware of protecting their skin from the sun! The Charles Owen SP8 Helmet provides that better sun protection with a specially designed visor to shade the whole face and upper neck. To maintain the Charles Owen flattering look, the brim is deeper and wider to provide additional coverage while still remaining stylish. The GPS First Lady 2X helmet is the first helmet developed for ladies! Same technical assets and same comfort as the Speed’air model Features aeration, safety, light weight. Imported. Charles Owen SP8 Helmet is rated 4.7 out of 5 by 9. 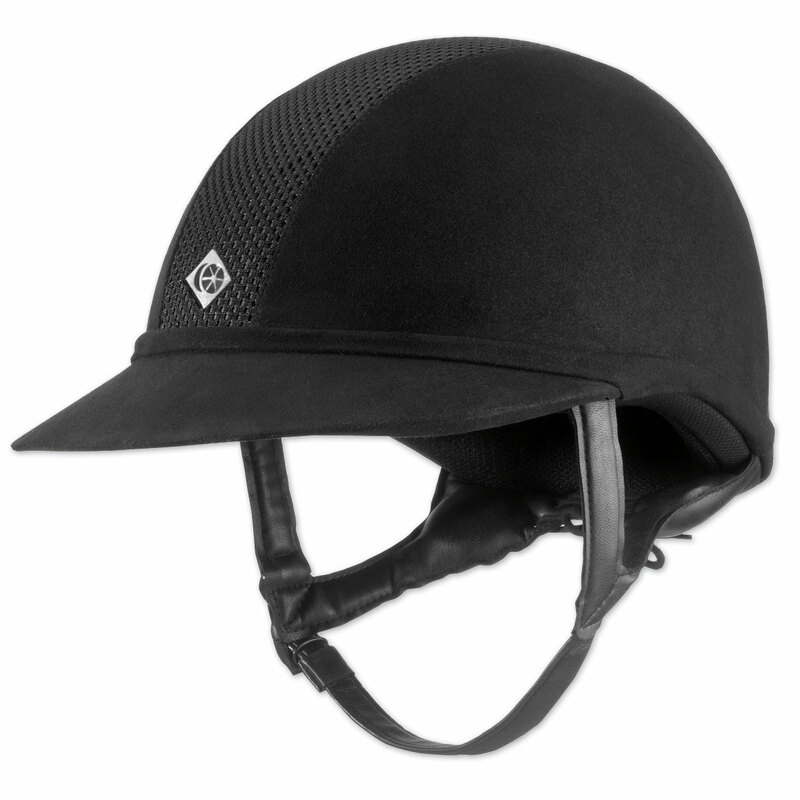 Rated 5 out of 5 by Warmbloodplease from LOVEE I LOVE this helmet!! I get so many compliments on it! In fact my friend liked it so much she got the same one. Blocks the sun and the classic CO look is kept even with the wider brim. I like it a lot better than the GPAs which are less conservative. Rated 5 out of 5 by Samantha from The "First Lady" for Charles Owen Lovers Being a Floridian, I need protection from the sun, and I hate to ride in sunglasses. I have been wearing the "Equivisor" for years, but it sometimes would fly off on a windy day or while jumping. I coveted the wide brim on the GPA "First Lady," but I do not like the large bug eye vents, and I do not have the right head shape for GPAs. Being, a Charles Owen lover, I was elated to find this helmet. Classic look, wide brim, and ventilation, it checked all my boxes. I am not disappointed! I love my gorgeous new helmet, and I get compliments on it all the time. This is THE helmet to have in Florida! Rated 5 out of 5 by nchunter from Lots of compliments I ride in Florida and was looking into getting a "velcro-on" brim for eye shading and face shielding. Instead, I tried this helmet and am glad I did! Noticeable difference in the shading of my eyes, and tons of positive comments from other competitors at a recent show regarding the attractive profile. I can't tell you how many times I repeated the brand and where to get it! It does feel snug even though exact same size as my older CO, but hoping it will break in shortly. Rated 2 out of 5 by spartanfan from Not enough ventilation Because I live in central Texas, I bought this helmet for its extended visor. Unfortunately, it had very few air vents, so it would be much too hot. So, I guess it works if you have sun but cool temps. Disappointed & sent it back. Rated 5 out of 5 by Domsie378 from Love! Love the larger brim to protect my face from the sun. A little snug at first so my head would hurt after a bit, but it is much better now. Rated 5 out of 5 by Piper2 from Love it! Needed to replace my CO AYR8 after a bad fall and couldn't decide between getting the AYR8 again or trying the SP8. I decided to risk getting the SP8 and am so glad I did - it's great! I show indoors so the visor isn't really used for sun protection but it's super flattering and I get compliments on it everywhere. The visor isn't too big to be distracting but big enough to stand out from the AYR8. I purchased the same size in both helmets and both fit me fine. Rated 5 out of 5 by peggot from best purchase ever Have put off ordering a much needed new helmet as getting one to fit seemed like such a bother. With so many on the market just making an educated choice only added to the hassel. A client bought this helmet and raved about it. Tried hers on and one size up appeared to be good. Purchased and it fit perfect! Don't even know its on my head - cool & lightweight. Even enjoy teaching with it on in the hot florida sun. HIGHLY recommend! Rated 5 out of 5 by Onehotmess from Love this helmet! I had been wearing a visor to keep the sun out of my face while riding but the visors aren't very secure when it's windy out and kept blowing off my helmet. I finally made the decision to buy the Charles Owen SP8 and I love it! It does feel like its a tad bit larger than my show helmet which is the Charles Owen GR8 (I ordered the same size) but it's not really that bad. The built in visor shades my face, I'm no longer squinting and the ventilation is great. I know that I'll stay cooler when summer hits. I'm actually not dreading the south FL summer heat as much as I was now that I have this helmet! Rated 5 out of 5 by ZORIED from Best Helmet I've Ever Owned!! Great helmet! New mesh design inside front of helmet makes this helmet so cool, you can actually feel air flowing through. Also, the mesh design allows for less pressure from hairnets on the forhead. Great sun protection with a lower profile. Does run a bit big, usually wear 7 1/4 in Charles Owens, but had to order 7 1/8.